Sonia Gandhi, chairperson of India's ruling Congress-led United Progress Alliance (UPA), Friday expressed her wish that relations between India and China can be enhanced with common efforts by the two countries. During a meeting with visiting Chinese State Councilor Dai Bingguo, Gandhi said that there exists a very solid basis for developing friendly and cooperative relations between India and China. Dai conveyed cordial greeting and good wishes from General Secretary of the Central Committee of the Communist Party of China and Chinese President Hu Jintao, who also expressed his congratulations to the Congress party and the UPA for successfully winning a second term of government in the general elections this year. Dai said that the Chinese government pays great importance to developing long-term, stable and healthy friendly cooperative relations with India. Under the current international and regional situation, China and India have huge potentials to develop their bilateral cooperation as two biggest developing countries in the world. Dai also expressed his belief that the future of such cooperation is very bright. 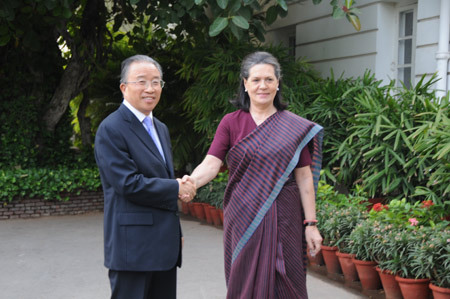 Dai praised the UPA for helping push forward relations with China since it assumed power more than five years ago. He said that President Gandhi has personally made great efforts for the development of Sino-Indian relations as leader of the UPA and the Congress party. Dai also said China is willing to make common efforts with India to upgrade the bilateral strategic cooperative partnership to a new level. Gandhi also memorized the 1988 historic visit to China by her late husband, former Prime Minister Rajiv Gandhi, as well as her attendance of the opening ceremony of the 2008 Beijing Olympics. She expressed her wish that as the 60th anniversary of establishment of diplomatic relations between India and China is nearing, the peoples of India and China, especially the youth of the two countries, increase human exchanges to build a good social foundation for furthering friendship between the two countries. Dai and Gandhi also exchanged views on strengthening friendly ties between the Communist Party of China and the Congress party of India.